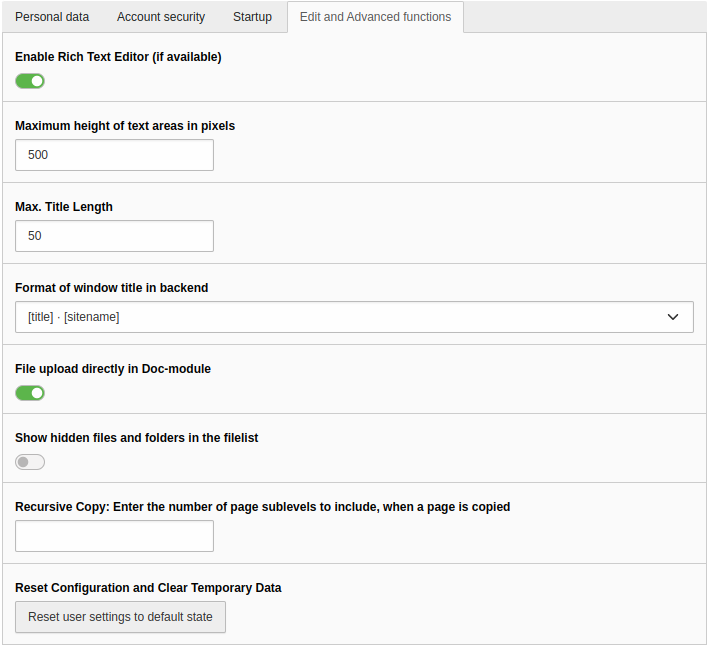 Default values and override values for the User Settings module. The "User tools > User settings" module may only represent a subset of the options from the table below. This sets default values of the property. A user may override these using its "User Settings" module. This affects only new users who did not login yet. It is not usually not possible to set new defaults for users who already logged in at least once. The only way to apply new defaults to existing users is by "Resetting All Backend User Preferences" in the "Admin tools > Maintenance" section of the install tool. This forces values for the properties of the list below, a user can not override these setting in its "User settings" module. So, overriding values will be impossible for the user to change himself and no matter what the current value is, the overriding value will overrule it. There is a tricky aspect to these setup.override: If first you have set a value by setup.override and then remove it again, you will experience that the value persists to exist. This is because it is saved in the backend user's profile. Therefore, if you have once set a value, do not remove it again but rather set it blank if you want to disable the effect again! One of the language-keys. For current options see typo3/sysext/core/Classes/Localization/Locales.php, e.g. dk, de, es etc. If set, then the hideAtCopy feature for records in TCE will not be used. This option makes textareas resizable. When moving towards the right or bottom border of the textarea, the mouse cursor changes to a resize cursor. This is active by default. This option makes textareas flexible, which means that their height grows automatically while typing. Limit is the maximal height set. This is active by default. Defines the maximal height of textarea (in pixels).